The CHM 0805-HT high temperature, high ohmic non-magnetic resistor series from SRT Resistor Technology offers the same features as the CHM 0805 range, while allowing for high temperature applications of up to 300°C. The main features comprise of a wide resistance range from 100kΩ up to 1TΩ, power rating of 0.125W and voltage rating of 200V trimmed or 400V untrimmed (tolerances ≥5%), all in a small 0805 surface mount package. By utilising SRT's meander structured thick film resistor technology, these chip resistors are able to offer tolerances down to ±2% (between 100kΩ and 100MΩ) as well as a TCR of ±25 ppm/°C and a VCR as low as ±100 ppm/V (between 100kΩ and 100MΩ). The CHM 0805-HT resistor series contains no organics making them suitable for high vacuum applications and offer PtAg (platinum silver) terminations for conductive gluing and soldering. The CHM 1206-HT high temperature, high ohmic non-magnetic resistor series from SRT Resistor Technology offers the same features as the CHM 1206 range, while allowing for high temperature applications of up to 300°C. The main features comprise of a wide resistance range from 100kΩ up to 1TΩ, power rating of 0.25W and voltage rating of 600V trimmed or 1000V untrimmed (tolerances ≥5%), all in a small 1206 surface mount package. By utilising SRT's meander structured thick film resistor technology, these chip resistors are able to offer tolerances down to ±1% (between 100kΩ and 100MΩ) as well as a TCR of ±25 ppm/°C and a VCR as low as ±50 ppm/V (between 100kΩ and 100MΩ). The CHM 1206-HT resistor series contains no organics making them suitable for high vacuum applications and offer PtAg (platinum silver) terminations for conductive gluing and soldering. The CHM 1210-HT high temperature, high ohmic non-magnetic resistor series from SRT Resistor Technology offers the same features as the CHM 1210 range, while allowing for high temperature applications of up to 300°C. The main features comprise of a wide resistance range from 100kΩ up to 1TΩ, power rating of 0.35W and voltage rating of 800V trimmed or 1200V untrimmed (tolerances ≥5%), all in a small 1210 surface mount package. By utilising SRT's meander structured thick film resistor technology, these chip resistors are able to offer tolerances down to ±1% (between 100kΩ and 1GΩ) as well as a TCR of ±25 ppm/°C (between 100kΩ and 10GΩ) and a VCR as low as ±50 ppm/V (between 100kΩ and 1GΩ). 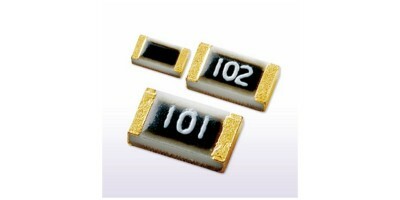 The CHM 1210-HT resistor series contains no organics making them suitable for high vacuum applications and offer PtAg (platinum silver) terminations for conductive gluing and soldering. The CHM 2512-HT high temperature, high ohmic non-magnetic resistor series from SRT Resistor Technology offers the same features as the CHM 2512 range, while allowing for high temperature applications of up to 300°C. The main features comprise of a wide resistance range from 100kΩ up to 10TΩ, power rating of 1W and voltage rating of 2500V trimmed or 3000V untrimmed (tolerances ≥5%), all in a small 2512 surface mount package. By utilising SRT's meander structured thick film resistor technology, these chip resistors are able to offer tolerances down to ±1% (between 100kΩ and 1GΩ) as well as a TCR of ±25 ppm/°C (between 100kΩ and 10GΩ) and a VCR as low as ±10 ppm/V (between 100kΩ and 100MΩ). The CHM 2512-HT resistor series contains no organics making them suitable for high vacuum applications and offer PtAg (platinum silver) terminations for conductive gluing and soldering. The CHR 0402-HT high temperature non-magnetic resistor series from SRT Resistor Technology offers the same features as the CHR 0402 range while allowing for high temperature applications of up to 300°C. The main features comprise of a wide resistance range from 1Ω up to 10MΩ, power rating of 0.05W and voltage rating of 30V trimmed or 60V untrimmed (tolerances ≥5%), all in a small 0402 surface mount package. By utilising SRT's thick film resistor technology, they are able to offer low tolerances down to ±2.0% (between 100Ω and 10MΩ) and TCR as low as ±50 ppm/°C (between +25°C and +85°C). The CHR 0402-HT resistor series contains no organics making them suitable for high vacuum applications and offer PtAg (platinum silver) terminations for conductive gluing and soldering. The CHR 0603-HT high temperature non-magnetic resistor series from SRT Resistor Technology offers the same features as the CHR 0603 range while allowing for high temperature applications of up to 300°C. The main features comprise of a wide resistance range from 1Ω up to 10MΩ, power rating of 0.1W and voltage rating of 75V trimmed or 150V untrimmed (tolerances ≥5%), all in a small 0603 surface mount package. By utilising SRT's thick film resistor technology, they are able to offer low tolerances down to ±2.0% (between 100Ω and 10MΩ) and TCR as low as ±50 ppm/°C (between +25°C and +85°C). The CHR 0603-HT resistor series contains no organics making them suitable for high vacuum applications and offer PtAg (platinum silver) terminations for conductive gluing and soldering. 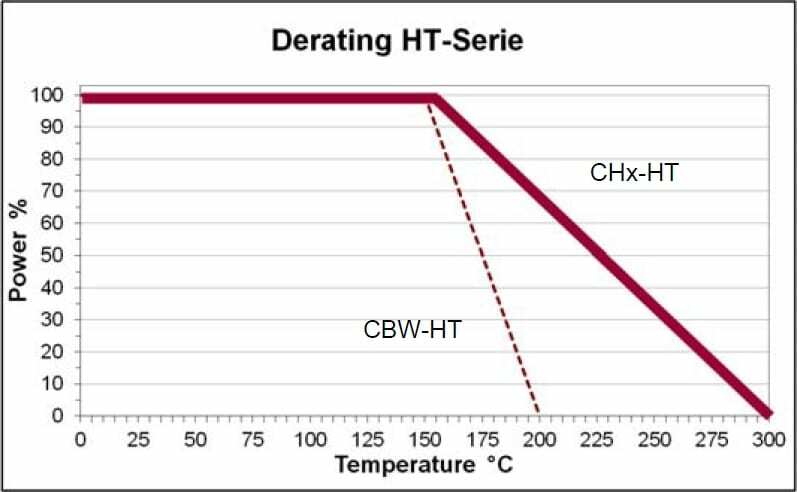 The CHR 0805-HT high temperature non-magnetic resistor series from SRT Resistor Technology offers the same features as the CHR 0805 range while allowing for high temperature applications of up to 300°C. The main features comprise of a wide resistance range from 1Ω up to 10MΩ, power rating of 0.125W and voltage rating of 100V trimmed or 200V untrimmed (tolerances ≥5%), all in a small 0805 surface mount package. By utilising SRT's thick film resistor technology, they are able to offer low tolerances down to ±2.0% (between 10Ω and 10MΩ) and TCR as low as ±50 ppm/°C (between +25°C and +85°C). The CHR 0805-HT resistor series contains no organics making them suitable for high vacuum applications and offer PtAg (platinum silver) terminations for conductive gluing and soldering. The CHR 1206-HT high temperature non-magnetic resistor series from SRT Resistor Technology offers the same features as the CHR 1206 range while allowing for high temperature applications of up to 300°C. The main features comprise of a wide resistance range from 1Ω up to 10MΩ, power rating of 0.25W and voltage rating of 200V trimmed or 400V untrimmed (tolerances ≥5%), all in a small 1206 surface mount package. By utilising SRT's thick film resistor technology, they are able to offer low tolerances down to ±2.0% (between 10Ω and 10MΩ) and TCR as low as ±50 ppm/°C (between +25°C and +85°C). The CHR 1206-HT resistor series contains no organics making them suitable for high vacuum applications and offer PtAg (platinum silver) terminations for conductive gluing and soldering. The CHR 2010-HT high temperature non-magnetic resistor series from SRT Resistor Technology offers the same features as the CHR 2010 range while allowing for high temperature applications of up to 300°C. 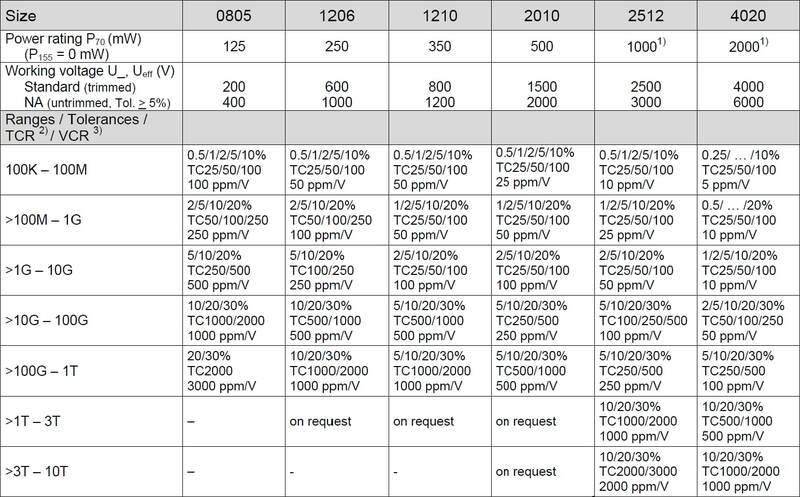 The main features comprise of a wide resistance range from 1Ω up to 10MΩ, power rating of 0.5W and voltage rating of 250V trimmed or 900V untrimmed (tolerances ≥5%), all in a small 2010 surface mount package. By utilising SRT's thick film resistor technology, they are able to offer low tolerances down to ±2.0% (between 10Ω and 10MΩ) and TCR as low as ±50 ppm/°C (between +25°C and +85°C). The CHR 2010-HT resistor series contains no organics making them suitable for high vacuum applications and offer PtAg (platinum silver) terminations for conductive gluing and soldering. The CHR 2512-HT high temperature non-magnetic resistor series from SRT Resistor Technology offers the same features as the CHR 2512 range while allowing for high temperature applications of up to 300°C. The main features comprise of a wide resistance range from 1Ω up to 10MΩ, power rating of 1W and voltage rating of 300V trimmed or 1200V untrimmed (tolerances ≥5%), all in a small 2512 surface mount package. By utilising SRT's thick film resistor technology, they are able to offer low tolerances down to ±2.0% (between 10Ω and 10MΩ) and TCR as low as ±50 ppm/°C (between +25°C and +85°C). The CHR 2512-HT resistor series contains no organics making them suitable for high vacuum applications and offer PtAg (platinum silver) terminations for conductive gluing and soldering. The CHR 4020-HT high temperature non-magnetic resistor series from SRT Resistor Technology offers the same features as the CHR 4020 range while allowing for high temperature applications of up to 300°C. The main features comprise of a wide resistance range from 1Ω up to 10MΩ, power rating of 2W and voltage rating of 500V trimmed or 1500V untrimmed (tolerances ≥5%), all in a small 4020 surface mount package. By utilising SRT's thick film resistor technology, they are able to offer low tolerances down to ±2% (between 10Ω and 10MΩ) and TCR as low as ±50 ppm/°C (between +25°C and +85°C). The CHR 4020-HT resistor series contains no organics making them suitable for high vacuum applications and offer PtAg (platinum silver) terminations for conductive gluing and soldering.